It’s almost Thanksgiving, which means turkeys everywhere will soon be in ovens, and amateur chefs everywhere will soon be nervously staring into said ovens for hours on end. 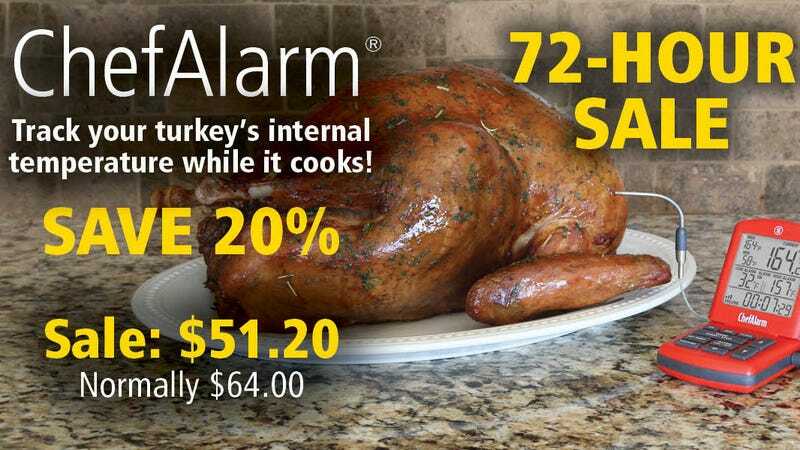 But how about spending those precious holiday hours with family and leaving the turkey monitoring to this ThermoWorks ChefAlarm, down to just $51 today. The ChefAlarm is designed for commercial use, so you know it works. Plus, it has a volume-adjustable high alarm, for when your food reaches your chosen high temp, and a low alarm, for cold dishes. And by the way, ThermoWorks also makes the Thermapen, your favorite cooking thermometer, so you know your turkey is in good hands.